These sweet scones are to die for! 1. Preheat the oven to 400°F. Line two baking sheets with parchment paper. 2. In the bowl of an electric mixer fitted with a paddle attachment, combine the flour, oats, baking powder, sugar, and salt. Blend the cold butter in at the lowest speed and mix until the butter is in pea-sized pieces. Combine the buttermilk, maple syrup, and eggs and add quickly to the flour-and-butter mixture. Mix until just blended. The dough may be sticky. 3. Dump the dough out onto a well-floured surface and be sure it is combined. Flour your hands and a rolling pin and roll the dough ¾ to 1-inch thick. You should see lumps of butter in the dough. Cut into 3-inch rounds with a plain or fluted cutter and place on baking sheet. 4. Brush the tops with egg wash. Bake for 20 to 25 minutes, until the tops are crisp and the insides are done. 5. 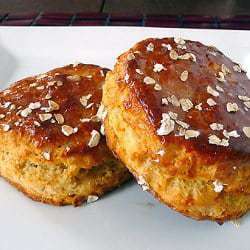 To make the glaze, combine the confectioners' sugar, maple syrup, and vanilla. When the scones are done, cool for 5 minutes, and drizzle each scone with 1 tablespoon of glaze. Sprinkle some uncooked oats on the top, for garnish. The warmer the scones are when you glaze them, the thinner the glaze will be.